I walk this road quite simply because there is no alternative. I think, even now, if there was somewhere else to go I would take another route. But all other options have been exhausted. I try not to think of the distance because, weary and hungry as I am, I just can’t contemplate the physical effort required to walk so far. And so I shield my eyes from the noonday glare and put what little energy I have into taking each next dusty step. What a sight I must look, my hair matted with whatever dirt and undergrowth I’ve slept on for the past few weeks. I know I stink, and not just because I haven’t been able to wash or bathe. The muck is clinging to my clothes and skin; some is even stuck in my hair. “How are the mighty fallen,” I exclaim aloud. My voice startles the birds twittering in the long grass at the edge of the road, and they fall momentarily silent before resuming their chirping, unconcerned by my troubles. Disgust and anger struggle within me – a tussle between shame and blame. I’m a disgrace. Everything that has happened to me, I have brought on myself. Or have I? What was my father thinking, when he agreed to my request? What kind of father fails to exercise proper control over his son? If he had said a simple no at the time, I would have had a tantrum and a sulk and then got over it. This is all his fault. Or is it? Would I really have got over it so easily? Not with that self-satisfied prig of a brother breathing down my neck like a goody two-shoes. That was the real reason I had to leave. My brother was making my life intolerable. This is all his fault. I’m sure all the neighbours have their own opinions about all this. I daresay I’m the black sheep of the family, not worthy to be part of their community any more. But what do they know? They have no idea what drove me to leave. They never saw the digs or heard the snide remarks muttered as we passed each other in the gate. It’s all their fault, my father and my brother, this is all their fault. Except it isn’t. Whoever heard of a son demanding his share of the inheritance while his father’s still alive? What was I thinking when I made the ultimatum? I might as well have told him I wish he was dead. And what do I have to show for it now? My father worked all his life for that money and I haven’t invested it in one worthwhile thing. It’s all gone and I haven’t got so much as a pair of shoes on my feet. This is all my fault. And so it goes on, step after shuffling step, blame and shame, blame and shame. More to the point, what on earth can I say that will prevent them from just driving me away? I bet they’ve gone round bad-mouthing me to all the neighbours. No, that’s not fair. I bet my brother has. But I’ve never heard my father say a bad word about anybody, not even people who cheated him or failed to repay what he lent them. Whatever he thinks of me, he will have kept it to himself. But I’m sure my brother will have spread enough ill will for both of them. I have to think of a narrative that I can be saying to my father as I approach, before I get close enough for him to answer me back. Half of me wants to shout, “This is all your fault – you and that stuck up brother of mine!” But he’s hardly likely to give me a hearing if I do. Better switch from the blame narrative to the shame narrative. “Father, I have sinned against heaven and before you. I’m no longer worthy to be called your son.” I’ll only be echoing what he’s thinking anyway, so I guess he won’t argue with that. What if he turns his back on me anyway? Better think of a follow-up remark so he doesn’t just slam the door in my face. “Make me one of your hired servants.” At least that way I’ll have bread enough and to spare. And I can retreat into the servant’s quarters every time the urge to slap my brother’s smug face becomes irresistible. And so it goes on, step after step, the thoughts swirling round and round in my head like the maelstrom at the foot of a waterfall. Somehow, step by step, step by step, blame and shame, blame and shame, the miles get swallowed up. The fields along the side of the road just here belong to my father – I’m nearing home. I look up, in time to see one of our neighbours, a wealthy landowner, directing some hired workers in the field. He sees me, makes an exclamation of disgust, and turns his back. I’m confused. What is he doing in my father’s field? Gradually, the appalling reality dawns on me, and for once the shame reverberates in my head, completely drowning out all thoughts of blaming someone else. Evidently, my father has had to sell some of his land. Because of the share of the money that I took, some of our family’s fields, the land that has been ours for generations, has had to be sold. I slow my pace as I slouch up the road, not yet daring to look at the house I used to call home. Is there even any point going on? But where else can I go? There is nowhere. Confused, uncertain, I hesitate, not daring to go on, not caring to go back. And then, suddenly, there he is in front of me. He throws himself at me and wraps his arms around me, pulling me close to his heart and holding on tightly. “My boy, my boy,” he cries in a voice choking with emotion as he buries his face in my hair and the twigs and pig muck scrape against his cheek. I start to blurt out the words I’ve been rehearsing: “Father, I’ve sinned against heaven and before you. I’m no longer worthy to be called your son.” But before I can go any further he places a hand on the back of my head and squashes my face into his shoulder, making further speech impossible. And hugged in that relentless grip, both the blame and the shame quietly pack their bags and slink away. Whose fault is it? Who cares? There’s a love right here that erases it all and wipes the slate clean. I hate thinning out seedlings, choosing which ones to sacrifice so that the others will thrive; but that was how I spent the afternoon yesterday. 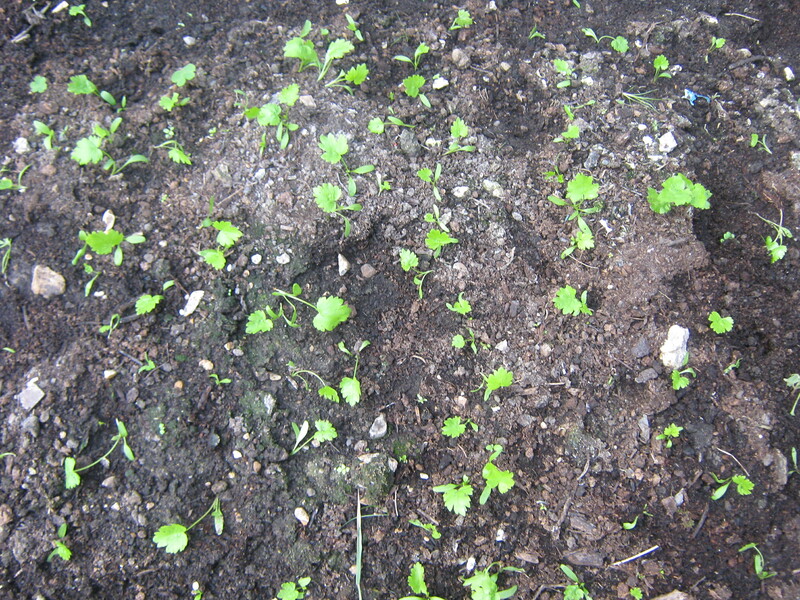 I transplanted as many as I could, in the hope that some would survive, but still, a large number had to end up on the compost heap. Even these ones, however, are not going to waste – they will help to fertilise next year’s growth. What surprised me (I was thinning out carrots and parsnips) was how much develops below ground before anything is even visible on the surface. Even some which had barely more than the tip of a green shoot showing through the soil had roots of more than an inch long; ones which were sporting two or three leaves had roots of two to three inches in length. I tried to select not the leafiest ones, but the ones with the most intact roots to transplant elsewhere in the vegetable plot, as I thought they would have the most chance of successfully establishing themselves. It got me thinking. How often we look at the bits we can see in the soil of a life – our own or someone else’s – and draw conclusions and judgements from that. I hear someone (myself or somebody else) say something unkind; I see them act in a way that is unwise; and I draw a conclusion about their spiritual state – they must be in a bad place spiritually or they would not appear so unChristlike. Yet all I can see is some immature shoots poking through the soil, looking as though there is plenty of room for improvement. What I can’t see is that in a secret place, away from view below the soil, an ever-deepening root is pushing down into the life source; and no matter how feeble the appearance above ground, maturity and fruitfulness are guaranteed, however long it takes, because something deep and strong is forming and becoming established. That’s why it’s unwise to pass judgement on myself or anyone else; I can’t see what God can see, I don’t know what He knows. And it’s also why God reminded Samuel that people look at the outward appearance but God sees the heart. I’m not going to chide or nag my plants for not looking big enough or strong enough. I’m going to water them regularly, weed around them, and generally tend and nurture them. I guess that’s what we should do when we see a fellow-Christian whose behaviour falls short of a standard we think they should attain. Not judge; not jump to conclusions about the parts of their spiritual and emotional development that we can’t possibly know about; but encourage, nurture, remove the obstacles that might hinder their growth, and water with the encouragement of God’s word – and then sit back and enjoy the beauty and nourishment that God brings from their life. with clarity that blows the mist away. they can ennoble, making jewels from clay. fearing the silence that we rush to fill. if swords, we would be careful not to kill. the Word of God: what God most longed to say. has washed my bleakest silences away. He turned. He smiled. He spoke. The word was, “Come”.